Available again due to demand! The true wildcat is now an endangered species and only to be found in inaccessible parts of the Scottish mountains. It may look like a giant domestic tabby, but with its bright red tongue and vicious claws, it is a formidable and fearless opponent of mankind. It is justly noted for being untameable. To begin with, Mike became the custodian of two spitfire kittens, found abandoned in a ditch when only a few weeks old. Even before they were fully weaned in his kitchen, they could be approached only with extreme care, usually with thick gauntlets as protection against the ravages of tooth and claw. He named them Cleo and Patra, and built them a sturdy natural pen between his lonely cottage and the west wood. The kittens were only seven months old when a spitting and snarling ten-year-old tomcat arrived from London Zoo to change all their lives. 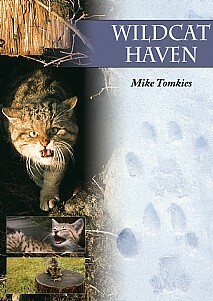 Mike resolved to breed a wildcat family and prepare them for a return to the wild. In the years that followed little of the scant scientific theory on wildcat behaviour was borne out by his careful observations. An update of the lengthy appendix which discusses wildcat populations, history and research on the breed including issues of genetic purity is included in this new edition. Mike's extraordinary adventures in raising and releasing no fewer than three litters, two pure wildcat and one hybrid from a domestic male gone wild, are full of incident, at times hilarious, and deeply moving. The runt of Cleo's second litter demolished Mike's last defences by giving him her total trust and affection while fiercely retaining an utterly wild and independent nature, so he became first to 'tame' a wildcat. This unique story of communion between man and animal is taken from two books that have long been out of print - My Wilderness Wildcats and Liane, A Cat from the Wild - revised and updated by the author and illustrated with many new photographs, all in colour.